The government can’t force tobacco companies to put graphic warnings on cigarette packets. THE FEDERAL US government has been told that it can’t force tobacco companies to put large graphic health warnings on cigarette packages to show that smoking can disfigure and even kill people. In a 2-1 decision, the U.S. Court of Appeals in Washington affirmed a lower court ruling that the requirement ran afoul of the First Amendment’s free speech protections. The appeals court tossed out the requirement and told the Food and Drug Administration to go back to the drawing board. 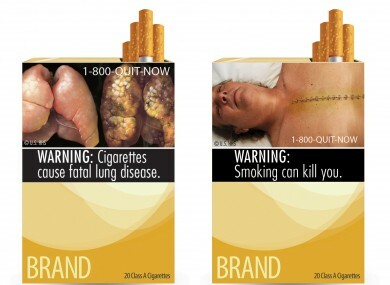 It’s a different story from earlier this month when Austalia’s highest court rejected an appeal from tobacco companies against new rules which will stop manufacturers from keeping their customised designs on their boxes – instead forcing them to carry graphic health warnings. The decision is considered a blow to one of the Obama administration’s major public health initiatives, raises the prospect of another U.S. Supreme Court tobacco battle and opens the door to further challenges of FDA’s regulatory scheme. Some of the nation’s largest tobacco companies, including R.J. Reynolds Tobacco Co., sued to block the mandate to include warnings to show the dangers of smoking and encouraging smokers to quit lighting up. They argued that the proposed warnings went beyond factual information into anti-smoking advocacy. The government argued the photos of dead and diseased smokers are factual in conveying the dangers of tobacco, which is responsible for about 443,000 deaths in the U.S. a year. The nine graphic warnings proposed by the FDA include color images of a man exhaling cigarette smoke through a tracheotomy hole in his throat, and a plume of cigarette smoke enveloping an infant receiving a mother’s kiss. These are accompanied by language that says smoking causes cancer and can harm fetuses. The warnings were to cover the entire top half of cigarette packs, front and back, and include the phone number for a stop-smoking hotline, 1-800-QUIT-NOW. The court also wrote that the FDA “has not provided a shred of evidence” showing that the warnings will “directly advance” its interest in reducing the number of Americans who smoke. Tobacco companies increasingly rely on their packaging to build brand loyalty and grab consumers — one of the few advertising levers left to them after the government curbed their presence in magazines, billboards and TV. The FDA declined to comment on pending litigation and the Justice Department said it would review the appeals court ruling. Public health groups are urging the government to appeal. Warning labels first appeared on U.S. cigarette packs in 1965, and current warning labels that feature a small box with text were put on cigarette packs in the mid-1980s. Changes to more graphic warning labels that feature color images of the negative effects of tobacco use were mandated in a law passed in 2009 that, for the first time, gave the federal government authority to regulate tobacco. The share of Americans who smoke has fallen dramatically since 1970, from nearly 40 percent to about 20 percent. But the rate has stalled since about 2004, with about 46 million adults in the U.S. smoking cigarettes. It’s unclear why it hasn’t budged, but some experts have cited tobacco company discount coupons on cigarettes and lack of funding for programs to discourage smoking or to help smokers quit. In recent years, more than 40 countries or jurisdictions have introduced labels similar to those created by the FDA. The World Health Organization said in a survey done in countries with graphic labels that a majority of smokers noticed the warnings and more than 25 percent said the warnings led them to consider quitting. Joining North Carolina-based R.J. Reynolds, owned by Reynolds American Inc., and Lorillard Tobacco, owned by Lorillard Inc., in the lawsuit are Commonwealth Brands Inc., Liggett Group LLC and Santa Fe Natural Tobacco Company Inc.
Virginia-based Altria Group Inc., parent company of the nation’s largest cigarette maker, Philip Morris USA, which makes the top-selling Marlboro brand, is not a part of the lawsuit. The case is separate from a lawsuit by several of the same tobacco companies over the 2009 Family Smoking Prevention and Tobacco Control Act, which cleared the way for the more graphic warning labels and other marketing restrictions. The law also allowed the FDA to limit nicotine and banned tobacco companies from sponsoring athletic or social events or giving away free samples or branded merchandise. In March, a federal appeals court in Cincinnati ruled that the law was constitutional. The contradicting decisions mean the case could be settled by the U.S. Supreme Court on appeal. Email “US court upholds block on graphic cigarette warnings”. Feedback on “US court upholds block on graphic cigarette warnings”.